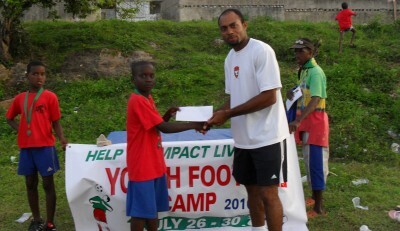 Damion Smith received the Most Outstanding soccer-scholar inception award. The purpose of the award is to encourage students who play soccer to strive to excell academically also. The award is worth $200 USD (over $16,000 JD) and is geared to assist with back to school preparations: text books, stationary supplies, etc. Damion is 13 and attends Cornwall College High School (in Montego Bay). He plays for his school’s U-14 soccer team and also the Rose Hall U-15 soccer team. Damion maintains a “B+” average while playing soccer. He wants to become a meteorologist.